Kiarostami believes that everyday life should be reflected in a film, and in our everyday lives we have no idea what will happen to us tomorrow or with whom we will fall in love…. 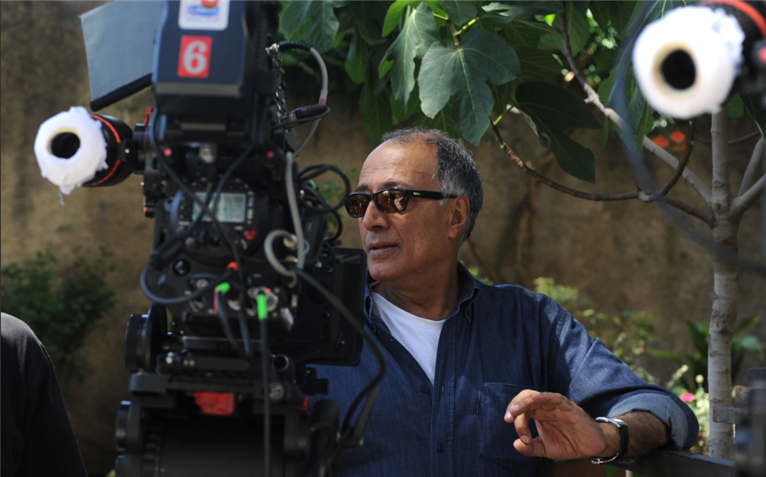 As the producer, I should have understood long ago that Kiarostami’s films are not tinged documentaries. He plants trees along streets, he expands houses, transforms the walls in another person’s home in one simple turn and gives subtle attention to every aspect of the framing of the screen. He configures reality, really…. Even I, as an admirer of his films, did not realize that the hidden reality behind this “zig-zag path” of his was in fact part of his unique work. On one level, two local critics pretty much summed it up: “”It’s so real!” one told me; the other, “Very smooth and nice.” Yet Like Someone in Love (at the 2012 AFI FEST Presented by Audi) really shines somewhere between these two lines. Concrete as it is complex, plain and simple as it is intricate, Kiarostami’s greatest work in arguably his best film is all of a piece. Amidst his evolving elaborations of reality through style, this master shows us the mystery that is cinema. Now I must admit that on my own first viewing, Kiarostami’s latest venture took me back to a stop in Tokyo in my early 20s when it was the first megalopolis I had visited away from home, and what surprised me even more than the scale of the city’s traffic and buildings and the speed of its Bullet train was its sophisticated jazz — how very good and popular it was. I couldn’t read a single sign on a street, but I could feel instantly at home. Kiarostami must have felt likewise, an Iranian writer-director working with a French producer and a Japanese cast and crew, all with no common language but American jazz. Yet his young protagonist Akiko is not so fortunate, it seems. Midway into the film she sighs, “I don’t want to find out my mistakes. I’m depressed enough as it is.” By then we surmise she’s come from a small fishing village south of Tokyo, where she now attends the university. But to start, we visit one of those cozy jazz clubs where we meet her first by her voice alone, and soon enough, wonder if we should really trust it. Is she lying to the male on the other end of her cell call? How would we know when we can’t even see her face? A jaunty redhead takes the phone and flirts with him, and then an older man pulls up a seat and has a talk with Akiko. This boy has brought her nothing but trouble. She should dump him and get on with her evening. Upon her screeching protest, the man puts her into a taxi and sends her on her way. It’s only after this long take of an extended single sequence in a busy bar that we piece together what has transpired: a pimp has just sent a call girl to a John. This is hardly the turf of Kiarostami’s Iranian stories, nor even the emotional landscape of the cinematic neighbor to Like Someone in Love, the writer-director’s Certified Copy of last year, also shot abroad (in Tuscany) and also playing on themes of assumed and mistaken identities. In that film, not only the presumed roles but even the pretexts shifted from scene to scene, and we were called upon to decide who was really who and why it mattered. Here as the film proceeds, we make our way through people, poses, replicas and reflections seemingly without a through-line at all. Is there really a story? And does that really matter? More and more as this film sweeps me up in its mood, I fall in with the musical play of its ruses — the sliding of images over surfaces, the pliability of the characters, the tension between the layers, and the tautness that could snap. All these rides through the city, from Roppongi to the station to the suburb to the campus, in cars where the same people take up different seats and personae and destinies, trying them on for size, so to speak, return us to refrains that land in a different register, with another tempo, and a new rhythm of their own. The ever subversive trajectory freely doubles back on itself and leaves us in a gasp, yet we carried ourselves there all along, on a cloud of song. It may be that no one today spins out an apparently banal scene the way Kiarostami does, with as much time to drink in the ambiguities, digest the ruminations, and come out the other side on another plane, perhaps alerted, enlightened, disillusioned, or somehow restored. Ceylan comes close in his enchanting Once Upon a Time in Anatolia, but he still sticks to narrative, and Tarr takes us there with his Turin Horse, though we’re looking for an allegory. Kiarostami brazenly circles round and round on familiar ground in Tokyo with unfamiliar faces in his actors. An off-screen grandmother and her onscreen male counterpart might recall Ozu’s Tokyo Story (1953), but for me this Tokyo feels more like that of Hou Hsiao-Hsien in Café Lumière (2003), and even like Hou’s Paris in the first film he made in the West, Flight of the Red Balloon (coincidentally, with actress Juliette Binoche, from Kiarostami’s Certified Copy, his own first film in the West). The lush textures of in-frame composition within relatively austere settings that Kiarostami creates, the low-key and improvisational style of acting that lets us bask in the mise-en-scène during prolonged takes, the elliptical editing that lets us ride out of narrative time and into our own reverie: these are all alive in Hou’s films as well, whether we look at Juliette Binoche dismayed on her cell phone in the back seat of a moving car or an actor-less choreography of city lights and colors in nighttime Tokyo. And for both auteurs, the effect is far closer to the art of jazz as cinema — or cinema as jazz — than is any valentine Woody Allen ever made to Paris or Rome or Barcelona, or even New York for that matter, Cole Porter and the Gershwins notwithstanding. Granted, it takes more than the velvety voice of Ella Fitzgerald to croon us into a spell in a film of this ilk — and isn’t that just the point? Hardly in another song — neither in “Trane’s Slow Blues,” nor in “Solitude” or “Sophisticated Lady” from Ellington and Fitzgerald, nor even in Professor Emeritus Takashi’s “Que Sera, Sera” (that puts a one-time smile on Akiko’s face and is played for irony) — is the jazz to be found in the film; in fact these ambient on-screen tracks serve as the film’s only score. Rather, the “music” is in the images, the movement, the dialogue, stemming from Kiarostami’s core concept and method of filmmaking. Nervous chit-chat (call it foreplay) about a replica of a painting on Takashi’s living room wall (Chiyoji Yazaki’s “Training a Parrot,” 1900) alludes to Kiarostami’s own film. The art work is special because it was Japan’s first oil painting with a Japanese subject and a Western style, Takashi tells Akiko. But her uncle once told her it was a portrait he painted of her, and her grandmother convinced her that it was actually the parrot teaching the girl to speak. And now we will soon hear Akiko's possessive fiancé ridicule the whole prospect of training and teaching, especially at the university where Akiko studies sociology, Takashi’s field. “What do they teach them in there? As if dusty old foreign books will open their eyes!” It’s a jungle out there, he tells Takashi, while he, a stranger, literally hijack’s the old man’s car, albeit in a most genteel way, and inscribes him as Akiko’s grand-dad. Takashi decides to go with the flow and then becomes as ignoble as Noriake, the beau, is noble — or is it really vice-versa? Noriake opens his heart to Takashi and the elderly gentleman tells the restless youth that he lacks experience. “So experience means swallowing a pack of lies?” Noriake retorts. And Takashi asserts, “I’m simply telling you things as they are.” And he is. And Takashi's sinister posing packs a wallop. The ensuing dialogue is so uncanny, so impeccably witty, barbed, and smooth at once, that it’s all we can do to keep up with the “ride” — in a parked car, no less. For me this scene, a stationary two-shot in a cramped car, is as true-and-false-and-wise as any exchange from Molière or Marivaux and as translucent as any verse from Khayyám, for that matter. Delicately subversive of the car as a sexual vehicle, the dialogue transpires after Takashi has made a gorgeous 180-degree turn to drive Akiko from his home to the campus. Could there be a more mesmerizing windshield in cinema today as all the colors and clouds of the sky dance upon it? Tokyo’s reflections take up their own “solo” as they upstage both driver and passenger and we contemplate where we’re going. Upon our arrival, this scene is the crux of the film. It gives ballast to Akiko’s scenes, a tearful one in a cab as she plays back her grandma’s voice-mails and a sulking one on Takashi’s porch-step as a nosy neighbor lady rubs salt on her wound with innuendo-laden banter. Both older voices arrive disembodied, the grandma's digitally mediated and the neighbor's through the backyard air until a pulled sheer curtain gives the lady a peek through her window and us a peek at her. These floating, trailing, female voices that began with Akiko’s own in the jazz café (and are so prevalent in Kiarostami’s The Wind Will Carry Us) are the audio counterpart of the elegantly ghostly visuals of Akiko, for example, the glazed reflection of her body on the surface of the TV screen in Takashi’s bedroom as he sits adjacent to it, wooing her from the bed to the kitchen for his homemade soup from her region. In this extended two-shot that carries the filmic-musical motif, the ironies abound. It’s worth digressing here to consider how this artist works. Unaccustomed to showing up with a written script on a movie set ready to shoot, Kiarostami generally builds from a series of filmed sketches. In 2002 he had already had Marin Karmitz, his French co-producer, film him as he explained and illustrated a scenario of taxi drivers circling Tokyo in the night. In 2004 while in Tokyo, Kiarostami made a test of that scene, this time with an elderly lady plucking a photo of a call girl posted in a phone booth and waiting on a busy corner while he circled her in a car, his digital “camerapen” shooting from inside it. Once he actually commenced production of the film in 2011 by shooting the first scene, in the jazz café at night, all the extras were replaced and the scene was shot again. Each subsequent scene was revealed to the actors only one day ahead of shooting it. Kiarostami believed that with actors knowing neither the outcome of the film nor their relation to it, their performances would be life-like. There may still be those who carelessly consider all of Kiarostami’s finesse with the aural-visual world he creates here to be gratuitous, substituting postmodern panache for sound storytelling, or technical virtuosity for meaningful themes, or an opportunity abroad for commitment to the time-honored ethics of his cultural heritage and his personal legacy as a filmmaker. Does his latest opus depart from the low-to-the ground gravitas of his “Koker” trilogy, the genuine compassion of Close-Up, the philosophical heft of Taste of Cherry, the dire satire of The Wind Will Carry Us, the socio-political risks of Ten? I am arguing that Like Someone in Love embodies them all, in an attribute of Kiarostami's filmmaking as innate as any other: change. Continually surprising us and even himself by tackling the enigmas of his art from another front each time, Kiarostami is open to change, a tenet as fundamental to his modus operandi as improvisation is to jazz. The heart and soul of his film reside right there, in that lyrical openness. The same could be said of Abbas Kiarostami’s latest opus. It’s love — of people, of jazz, of cinema — that makes the changes. Director: Abbas Kiarostami; Producers: Marin Karmitz, Kenzo Horikoshi; Screenplay: Abbas Kiarostami; Cinematographer: Katsumi Yanagijima; Editor: Bahman Kiarostami; Sound Mixer: Nobuyuki Kikuchi; Sound Editor: Reza Narimizadeh; Production Designer: Toshihiro Isomi; Costume Designer: Misae Myamoto. Cast: Rin Takanashi, Tadashi Okuno, Ryo Kase, Denden, Mihoko Suzuki, Kaneko Kubota, Hiroyuki Kishi, Reiko Mori, Kouichi Ohori, Tomoaki Tatsumi, Seina Kasugai. Color, HD, 109 min. In Japanese with English subtitles.